Thought Leaders Global is an educational organisation that focuses on growing practices, businesses and careers. In this talking point—for which a lot of the thinking has been done collaboratively with my great mates and coauthors Scott Stein and Peter Cook—I wanted to tell our story and share the strategy we use to build a ‘specialist infopreneurial’ practice (we’ll explain this term in a little while if it is new to you). It is worth understanding the game we are choosing to play. It’s not the only game in town; we don’t even go so far as to say it’s the best game in town (although it is). It is simply a different game to the ones most people play. The career game — Get a job! When you leave school or college you typically get a job, learn some skills and spend 40–50 hours or so a week using those skills as part of someone else’s business. This is a pretty typical path for most of the working population. After a while, if you apply yourself, you rise up through the ranks, get really good at what you know, and maybe even find some ways to contribute to the workings of your organisation. Many Thought Leaders we meet love the challenge of working in this environment — they love innovating and running large scale projects within big businesses and organisations. People who work for someone else can still be Thought Leaders — they simply do their great work within businesses. They are what we call ‘intrapreneurs’. Many people decide that they want the freedom of working for themselves and so they start a business. This can occur when they realise that they are working to benefit someone else, or that they want to be in control of their own destiny. Many simply become ‘business owners’ who have in effect bought themselves a job, working within the business they create — often up to 60–70 hours per week! Some, however, work on their businesses and go on to become ‘entrepreneurs’ as they look for ways to start, grow and exit a business. The thrill of building businesses and selling them for lottery-like figures is the game they are playing. This post is not about starting, building and selling a business. And it’s definitely not about buying a job. 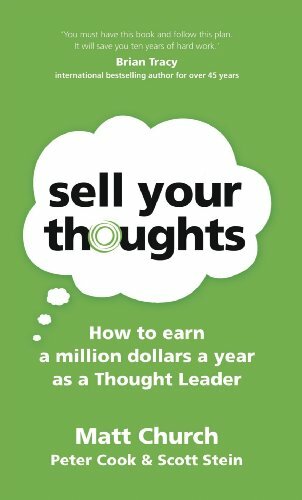 We at Thought Leaders believe that a specialist can achieve an income approaching and even exceeding $1,000,000 a year by leveraging their expertise and employing maybe one or two personal assistants. The infopreneur (a one-person business, such as an independent consultant) is a relatively new category of worker. Fiercely independent, unconventional, non-traditional and growing in numbers these people search for greater freedom and more control over their destiny. The following model – the revenue ladder taken from the book I wrote with Peter Cook and Scott Stein on this topic, Sell Your Thoughts – illustrates the income levels many of our program graduates have achieved. This ‘white belt to black belt’ model is the key focus of our Thought Leadership program and your Black Belt journey selling your thoughts. We will expand further on this model later on and give you specific strategies that you can use to move through these levels. There are all sorts of businesses, from BHP Billiton down to your corner fish-and-chip shop or milk bar (for Gen Y — a milk bar is like a convenience store from the olden days that closes at night and doesn’t sell frozen slushies). A successful business can operate separately from its founder or owner; and if it’s set up right, it can be sold. It is essentially about leveraging something other than the owner to make money. It might be leveraging other people’s time (staff) or it could be leveraging a technology or a piece of machinery. To be a business, you have to go from doing the work, as an owner, to getting the work done. An unsuccessful business is one where the owner has bought themselves a job — and typically a low-paid job with long hours working for a lunatic (themselves). 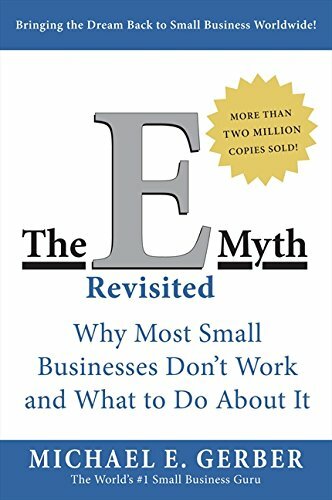 In his bestselling book The E-Myth Revisited: Why Most Small Businesses Don't Work and What to Do About It Michael Gerber explores what he calls the ‘entrepreneurial seizure’. This is the moment when people decide to start their own business. He uses the seizure analogy because he believes many have that initial entrepreneurial spark only to revert to working for a wage, but this time with the responsibility of paying all the bills as well. We couldn’t agree more that systems set you free. They don’t only apply to businesses; they also apply to practices. However, there is an important distinction around the primary focus of the game of business versus the game of practice. It’s about whether the focus is on freedom and money, or fulfilment and money. Many great entrepreneurs play a game of trading off fulfilment quite often in the short-term so that they can achieve freedom in the long term. Like exercise, there is a certain delayed gratification to the entrepreneur game. True entrepreneurs love the game of business and often don’t derive their juice from the actual business they are in. Instead, it’s the game of business that drives them. Often, it’s the multiples they can derive from the nature of the business. Insurance and call centres are examples of businesses that have great multiples but for many are not that stimulating in their own right. The infopreneur who builds a practice is a practitioner and is playing a different game. The primary pursuit is not freedom; it is fulfilment. Using the concepts in this book, freedom is attainable — but where entrepreneurs are working to get themselves out of a business, practitioners are putting themselves into their practice. This idea is quite simplistic in nature, but so fundamental to the Million-Dollar Expert game plan. Let's not make a case for one or the other — rather, what to start with. By playing two games, you end up not playing either very well. Know the game you want to play and understand the rules. Then, if you are playing the practice game and you get advice from a business expert you know to take it with a grain of salt. For example, media exposure is often great for a business. It drives awareness of who you are and what you do and can often lead to an increase in enquiries and, as a result, more business. In a practice, though, it’s all about leveraging positioning. Some media channels, even if good press, will create the wrong kind of interest and perhaps tarnish your professional image. In a practice it’s more about being professionally famous than it is about being known. This is a subtle example, but it helps to illustrate the different mindset needed to run a practice versus a business. We come across many people running practices who are getting well-intentioned but bad advice from people who know the game of business. How you conceptualise, plan, fund, market, sell, manage, document, grow and exit a practice is very different from how you do these things in a business. In your practice, the primary focus is to think, sell and deliver. In the early stages you will probably be doing many other things too, from booking flights to sending invoices, but as the Thought Leader in your practice your main three functions are to think, sell and deliver. You need to do the thinking — create the intellectual property and turn it into activities that will make a contribution to people. It is then up to you to sell these services or products, to get in front of your target market and invite them to participate in one of your offerings. Finally, you deliver your services and/or products, whether it’s a keynote speech or a coaching program, facilitating a process or developing workbooks. We call each of these offerings a cluster; they blend what you know, who cares about that and a delivery method that is leveraged in some way. For many years I thought of myself as an entrepreneur. I was being coached by one of the country's best business coaches. Each month, for about two years we would work on the business, exploring leverage strategies that in essence would get me out of the business sooner. I even met one of their recommended succession planning experts who turned out to be a bit dodgy. I should have known when the book he handed me had the words 'planning your get away’ in the title. To them it was if succeeding at the game of business was analogous to a great heist. Any wonder I almost lost my shirt (well several thousands of dollars at least) doing business with them. Then I met an entrepreneur for real, I went to their course, brilliant by the way on starting, growing and exiting a business for lotto like figures. A serial entrepreneur in love with the idea of business regardless of the business. This was such a great moment in my awareness, an epiphany if you like. I realised I didn't care that much about business. I love what I do and I love not having a job per se but I don't want to start, grow and exit a business for lotto-like figures. Over the years I’ve met a number of really successful entrepreneurs who had built and sold their businesses for serious 'go away’ money and yet they seemed empty. I realise I have not met all the successful entrepreneurs in the world but I had met enough to see a pattern: They had won the game of business but were unfulfilled. I had also met plenty of the struggling entrepreneurs who were working too many hours for too little money and lying awake at night wondering why they gave up their day job. Michael Gerber's answer to the entrepreneurial seizure is simple and shocking really; ‘If people are the problem, then systems are the solution.’ Build a business that is human proof, what he defines as a ‘turn key’ business and you will have made it. First time I read his book it changed my life, I converted a business I was running into a systemised, efficient, human proof, masterpiece and sold it! Bam!…but I did not feel like doing all that again and again, that game did not juice me anymore. There is a certain delayed gratification to being an entrepreneur. You work hard and if you win the game big time you get rewarded down the line. The number of people who start a business and fail though is quite staggering. Seems to be a little like those who are great as musicians but never seem to crack the big time. If you knew what was involved in business, you might not ever start one. Like child birth its always best if you don't know what's involved in too much detail or you might never have kids. For me though it's not about the fear of not making it, but rather the sense that ‘one day’ I will be happy. I guess I wanted that day to be ‘this day’ not some time in the future. So I started to think about whether there was a different way. I wondered, could I have the freedom that the entrepreneurial promise hints at without all the waiting? There is a way, but it's about learning the rules of a different game, the practice game versus the business game. I don't know if you are like me but all I wanted to do was the work, with clients. I didn't want to step away from the client-facing work. I get great satisfaction labouring in what I have now come to realise is a practice. I would need to do work I loved, with people I liked, the way I wanted. This, it turns out, is the key to fulfilment for thousands of experts and the compelling reason to run a Thought Leaders practice.